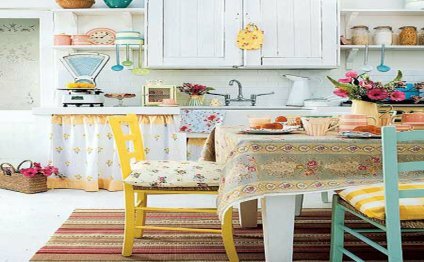 This colorful kitchen is worth your minute study. There are no wasted steps in serving meals or in cleaning up: A drop-leaf cart carries food from range and refrigerator to table in one trip. The folding doors of the dish cabinet open at touch to place contents within easy reach. Featured in the April 1957 issue. Featured in the February 1957 issue, this easily maintained kitchen has enameled steel cabinets with stainless steel counters, which blend beautifully with the warm quality of wood and plaster surfaces throughout the house. The custom-designed smoke hood over the cooking-top and barbecue is appropriately architectural. All activities revolve around this open kitchen. The cook can see and talk to guests, and when the accordion-like dining area partition is folded back, the kitchen enjoys the cheerful southern exposure. Featured in the May 1951 issue. The cooking counter in this kitchen works from the other side as an eating bar. The refrigerator niche in the brick wall is neatly closed in across the top with cabinets, making one move do the work of two. Featured in the June 1953 issue. This kitchen might not look contemporary today, but in 1950 it was ahead of its time — so much so that House Beautiful chose it as one of three "pace-setting" kitchens of the year. "When you can get a complete kitchen, laundry, and a place to eat into a space only about 12' square, it's a real achievement, " the editors gushed. The kitchen boasted a cooking range bisected by a work counter, a hooded ventilator and grille to control cooking steam, odors, and grease built into the wall cabinets, and a washer and dryer in their own corner. This ranch-house kitchen also was chosen as a "pace-setter" in 1950, sporting a "revolutionary electric range." "This comes in separate units, " the editors wrote. "The idea is to use as many four-burner tops, ovens, and storage drawers as space and need demand, in whatever combination is most appropriate. This flexibility of choice means you can have what you want, exactly where you want it, to cater to personal convenience."